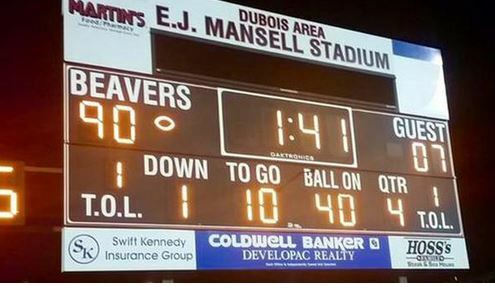 In what must have been a game for the ages, Meadville managed to outscore DuBois 107-90 in a high school football game Friday night per the Associated Press. Running back Journey Brown ran for 722 yards on 30 carries and 10 touchdowns to break a few records. Brown broke the Pennsylvania yardage record and fell short of the national high school record of 754 yards. DuBois quarterback Matt Miller passed for a Pennsylvania-record 741 yards and had 10 touchdown passes in his first start. The teams combined for 1,827 yards of total offense.